As much fun to say as it is to eat! 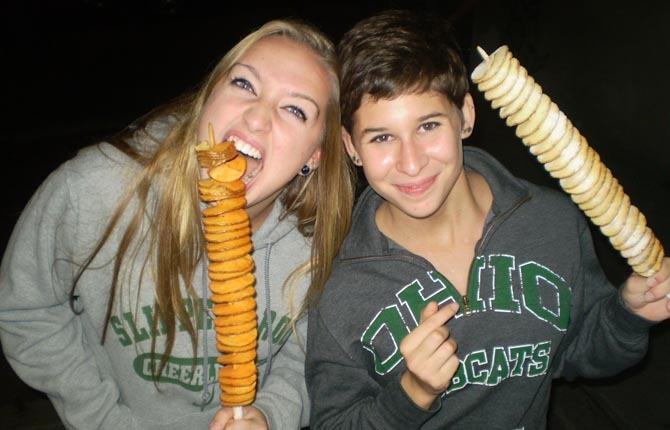 Tornado Potato Fries are a hit at fairs, festivals, street parties and just about any social gathering. Young and old alike enjoy the great taste of a seasoned, french fried spiral spud! French Fried Potatoes -- With a Twist! 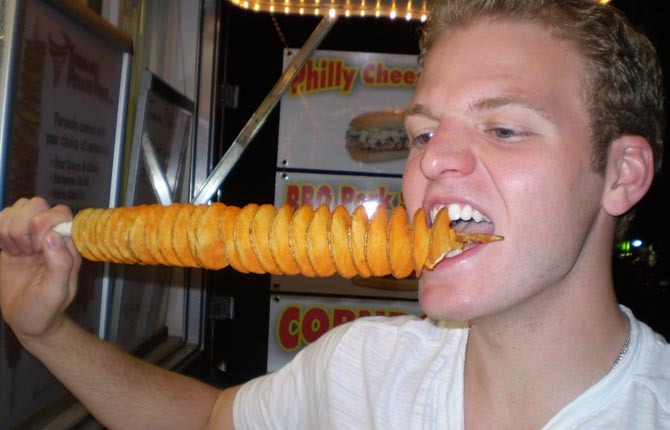 When Tornado Potatoes were introduced at the Las Vegas convention for the National Association of Concessionairs, Sitck-It Concessions in Southeast Ohio was quick to realize the potential of this great product. We outfitted our mobile concession trailer with the latest equipment for serving Tornado Potato Fries. For several years now, our concession business has been serving Ohio the great taste of Tornado Potatoes along with other great foods. 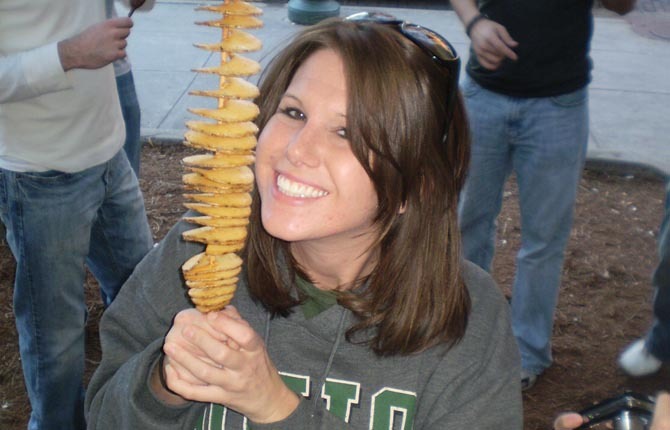 We spiral slice an Idaho Potato on an 18 inch scewer and then we french fry it to perfection. Add your choice of seasoning or enjoy it plain. We call them Tornado Potato Fries. They also go by other names such as Chip Sticks, Spiral Spuds, Potato Springs, Twisted Tators, Saratogo Swirls, and just plain Tornado Potatoes. Call them what you like, we are happy to serve them to you. 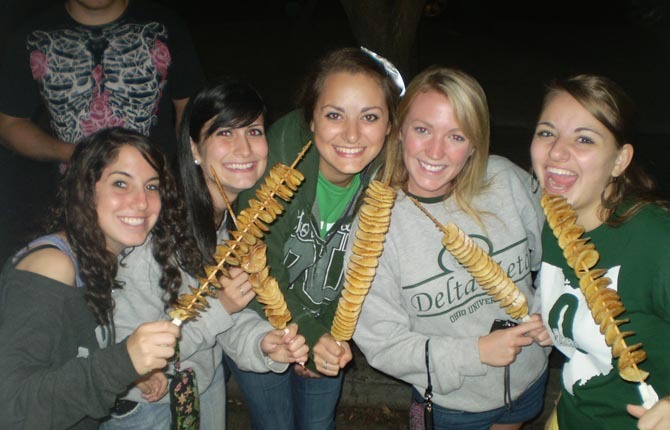 While we are based just outside of Athens Ohio, we do travel throughout the state to various fairs, festivals, and street parties. Our Concession business passes all state health codes and is fully licenced to vend throughout Ohio as well as other states. Do you have a Tornado Potato Picture! Your picture can be included on our webpage and our Facebook page by simply uploading it to our Facebook Wall. Simply go to our facebook site, Like Us, and upload your picture to our wall. It will automatically appear in our website gallery as well. Be sure to like us on facebook to receive updates and specials throughout the year. Thanks to all of our loyal customers in Athens Ohio! Try a Tornado Potato Today! Did You Know. . . . . . . . . . . . . . . The average American eats 137.9 pounds of potatoes each year! Potatoes were the first vegetable grown in space!